Having purchased a day of fishing with Peter Bauer at the July installation dinner auction, I teamed up with Michael Duncheon and met Peter at his shop, The Angler's Edge, in Gardnerville, NV, on Sept. 23. 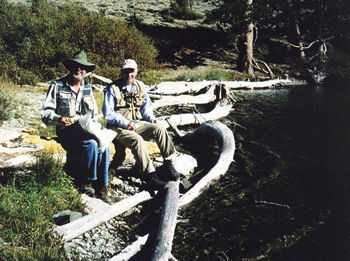 As most of you know, Peter likes small stream and lake fishing and knows the Eastern Sierras like the back of his hand. Over breakfast, he explained to us that, with the drought, just about all the streams were low and the fishing relatively poor. Having thereby lowered our expectations, he suggested a morning tour of some of the readily accessible streams, a mid-day jaunt to Emma Lake, where he suspected we might have a little fun, and a late afternoon on the West Walker. Off we went. We checked out Slinkerd Creek on Hwy 89 and Swauger Creek on Hwy 395, as well as several stops along the West Walker, while he talked about most of the spots he listed on the handout we got at his presentation to the club last Spring. He was right: the water was low, the creeks small and not a lot of fish in sight. Many of these creeks, Peter explained, are good spring fisheries. After grabbing some deli sandwiches, we headed up the hills above the Little Walker towards Emma Lake. The road is rough - don't try it in you Cadillac Seville. After reaching the trail head, it's about a 40 minute relatively tough hike up to Emma Lake. The lake is small, spring fed and beautiful - if you are willing to fight your way through the willows, just about every foot of the shore is fishable. There are plenty of brook trout in the 5 to 8 inch range. They are easily spooked but very hungry and therefore quite catchable. In an hour and half or so of fishing, the three of us caught about two dozen fish, all on dry flies. On the way back down the hill, we made quick stops on the Little Walker and Molybdenite Creeks, and then ended the day at a couple of places on the West Walker. Michael and I got a couple of nice fish there to end the day. Peter is a lot of fun to fish with, has a beautiful shop, and as mentioned before, is a veritable encyclopedia of knowledge of the Eastern Sierras. We took some of his advice the next day and fished Wolf Creek, the East Carson at the Carson River Resort and the dam at Indian Creek Reservoir, which we fished late in the afternoon. At the first two spots we caught a few fish, but struck out at the reservoir, where we fished from the bank. There were some big guys rising – we offered a variety of flies, but without success. On Saturday we headed home via Yosemite and fished the Dana Fork and the Tuolumne across from the Meadows Visitor Center – a couple of little guys at the former, nothing at the latter. 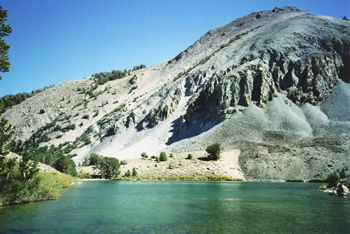 The same story, of course, as at the lower elevations: low water and few fish. But who can complain about a beautiful day in Yosemite? All told, a wonderful and educational day with Peter, a great time at Emma Lake, and mixed but beautiful fishing at the other spots.